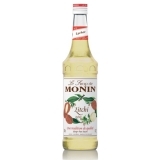 Monin Mango (Mangue in French) syrup in stylish 70cl glass bottle. The mango is the apple of the tropics, and one of the most commonly eaten fruits in tropical countries around the world. Mangos are delicious simply peeled and eaten plain or used in fruit salads and chutneys. The yellow to orange pulp is juicy, distinctively flavoured, and sweet. Monin Mango matches the fruit's unique flavour characteristics and, with its versatility, is ideal in countless beverages. 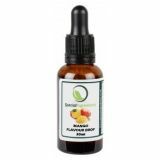 Sugar, water, concentrated mango and other fruit juices, flavouring, colouring agents: E161b, E163, emulsifiers: acacia gum, ester gum. Total fruit juice: 27% minimum including 10% mango juice. Please note: Not compatible with cold milk, hot milk or coffee.